Home / Event / Fashion Ghana / Ghana fashion and design week / WHAT WENT WRONG AT GHANA FASHION & DESIGN WEEK? WHAT WENT WRONG AT GHANA FASHION & DESIGN WEEK? There is always an end for every journey. The most hype event has come and gone but left many with questions unanswered. The whole experience is like a “sweet bitter thing” just like my friend Nana put it. I did my review of first and second day of the event. Click on Day1 or Day2 if you haven’t read it so that we can be on the same page. Let me remind you that Ghana Fashion & Design Week according to the organizers suppose to be “a celebration of Ghana’s fashion and creative industry and is aimed at educating and developing the industry platform to a worldwide audience”. But the question here is does the event achieved that purpose? Let’s look at the whole event according to activities that took place during the three days. The Seminar which was designed to be a platform for Knowledge transfer and a medium to Inspire and empower both existing and future creative practitioners was limited to small number of participants. In my opinion, the purpose of that seminar was not achieved because those that need the orientation most were not in attendance. It would be nice if it’s open to large number of participants next time. Is the event meant to promote Ghanaian designer in Diaspora or to expose the creativity in the country to outside world? That is a tough question for me to answer. Am going to leave that for you to answer after you finish reading. Someone actually said its “LONDON FASHION WEEK IN GHANA” and not GFDW. I was told many Ghana based designer’s application were turn done, all because the organizers want to certify their international media partner “VOGUE” standard by putting only notable label names on the show. The show also enjoys poor publicity locally as the organizers see no reason to invite local media or beg as one of the organizers put since none of them applied online as instructed by the organizers. I guess is because they have big fish “VOGUE”, why would they beg crayfish “Local media”. Throughout the two days of seminar and catwalk, I didn’t see any local media (TV & Radio) except some talk shows that used the opportunity to catch up with few celebrities in attendance to record another episode of their programme. Unreliable source told me that the organizers sponsored two bloggers from Nigeria (Bella Naija & Linda Ikeji) to cover the event but they said they can’t pay Ghanaian blogger (Ameyaw Debrah) to do publicity for them. There are lots of creative designers in Ghana that are looking for opportunity to showcase their talent to the world but they are not financially buoyant to go to London fashion week neither do they have money to showcase in Newyork fashion week. Even in our neighboring countries like Cote D’Ivoire and Nigeria. GFDW is the only avenue I think they should have to prove themselves but is like the show is meant to promote Ghanaian designers outside the country or established designers in the country and not upcoming designers. Let me give you example of what is happening in other African countries fashion week. Nigeria Fashion Week (NFW) recently partnered Obafemi Awolowo University Fashion show (Ife Runway Show) to pick best designer from the show to showcase at NFW along with other local and international designers and also three best models. In the same country Nigeria, there is MTN Lagos Fashion & Design Week meant to discover and promote emerging designers every year. Same in South Africa where they established “Renault-SA Fashion Week” to discover and promote emerging designers. Swahili Fashion Week was not left out, where numbers of emerging designers are discover every year through the fashion week emerging designer competition. The list goes on and on but opposite is the case of GFDW where attention was more on established designers than emerging. The question here is; How would the upcoming designers grow or the industry grow at large? I see no reason why emerging designers shouldn’t be given 40% slot on the show, 30% to established designers and the remaining 30% to international designers. After all, the event is meant to celebrate Ghana’s fashion industry. The rich culture of Africa was also lost on the runway. Almost 90% of the clothes showcased at the event were made from foreign materials. What happened to our beautiful Kente, lovely Ankara, lace, Kampala, etc. That happened because 60% of the designers participated on the show were from UK, USA, Germany and Italy. And let me remind you, the theme for the week is ethical fashion. What happened to ethical? I also want to add that the choice of venue was wrong for that kind of event. In my opinion, venue for fashion show of that gargantuan nature is not necessarily using the best hotel in the country that matter but good set up and well coordination does. Example is Glitz Africa Fashion Week at conference center. In all, I will not and never discredit the effort of the organizers because they did a wonderful job. Good show which am very proud to be part of it. Just that we human being are like Oliver Twist, we will keep demanding for more. 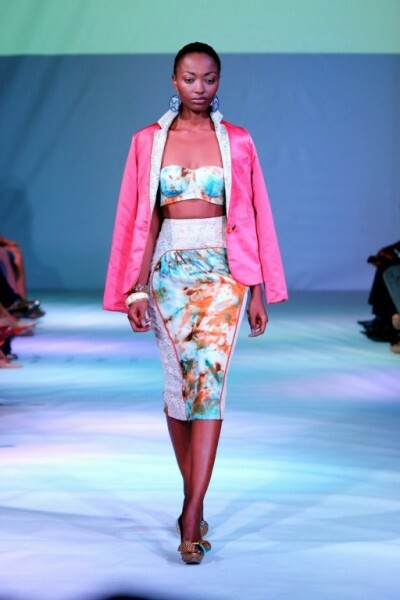 Kudos to the organizers for pushing Ghana fashion industry up on the international scene.